3. Flori­da Hos­pital Flag­ler Foun­da­tion Lea­der Recog­ni­zed /news/flori­da-hos­pital-flag­ler-foun­da­tion-leade..
4. Flori­da Hos­pital Recei­ves Se­cond Star Award /news/flori­da-hos­pital-recei­ves-second-star-awa..
5. Flori­da Hos­pital Flag­ler Opens Palm Coasts First Flori­da Hos­pital Centra Care /news/flori­da-hos­pital-flag­ler-opens-palm-coast..
6. Flori­da Hos­pital Memo­rial Medi­cal Cen­ter Na­med One of the Na­tions 100 Top Hos­pitals /news/flori­da-hos­pital-memo­rial-medi­cal-center-..
7. Flori­da Hos­pital Memo­rial Medi­cal Cen­ter Celeb­ra­tes Vo­lun­teers for 50 Years of Ser­vi­ce /news/flori­da-hos­pital-memo­rial-medi­cal-center-.. 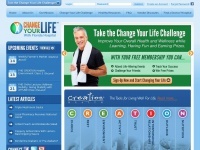 The web server used by Changeyourlifechallenge.org is located near the city of Ashburn, USA and is run by Amazon.com. This web server runs a few other websites, mostly in the english language. The websites were created using the programming language PHP and they are hosted on a Apache server, which runs on the operating system Cent OS (Linux). The content management system WordPress in the version 3.3.1 is used. The markup language of the website is XHTML 1.0 Strict. The visitor analysis software Google Analytics is used to analyze the visitors of the websites. The website does not specify details about the inclusion of its content in search engines. For this reason the content will be included by search engines.